Firm Profile We are a team of architects and designers with unique backgrounds, but we all have one thing in common â&#x20AC;&#x201C; we share a strong desire to use our expertise and knowledge to design solutions that will help people in moments that matter most. four decades of specialization enables effective communication, collaboration and precision in the complex, changing healthcare market. BROWSE Our Thoughts Click on our Thought Leader above to browse our website for Rehab-related spaces. To appropriately provide a continuum of care in a community, health and fitness options must be included. As has been proven with amenity-rich fitness clubs and gyms across the country, incorporating a convenient and full-service facility clustered together with other services where people work and play will attract clientele. Amenities should reflect data-driven research on the surrounding communities and complement other services provided to that demographic. Future demographic fluctuations should also be taken into account so the facility is designed with the proper amount of flexibility to adapt to its future members. On-unit physical therapy, when designed with patient-centered care tenets, can include space to involve family visits for both social and encouragement interactions. At Array, we strive to improve patient care outcomes through innovative, explorative designs that keep patients and caregivers as a priority. In conjunction with Anchor Health Properties and Indian River Medical Center, Array designed a 72,000 SF integrated medical home model health and wellness campus. This phase features a multi-specialty physician practice center with integrated diagnostics and health education. The building shares a healing garden with our recently completed cancer center and is designed to allow provider synergy between the programs. Built for optimal flexibility, a series of early process and design prototyping work sessions with stakeholders from each practice yielded a universal exam room for all specialties and primary care. Using this universal room in a standardized pod configuration allows Indian River to flex the boundaries of each individual service line on a momentâ&#x20AC;&#x2122;s notice without the need for renovation or cost. The full project is designed to promote prevention, education and healthy living in addition to providing chronic disease management and interventions. The project will feature cross discipline care coordination and a unified patient experience while being a market differentiator for Indian River. INTEGRATED CARE With an integrated multi-specialty Health & Wellness Center being designed by Array for the campus, Indian River Medical Center selected the same design team to bring a new Cancer Center to the community. An existing Radiation Oncology pavilion dictated the location of the new Center at a congested nexus of the campus. The new Scully-Welsh Cancer Center, affiliated with Duke University will bring state-of-the-art, compassionate care to the Indian River community. The Cancer Center will feature multi-modality clinics, integrated treatment planning, infusion, radiation therapy, resource and education programs and access to clinical trials and research. In a bucolic setting within the Indian River campus, a healing garden links the Cancer Center and Health & Wellness Center and creates new, dedicated open space on campus. The new Cancer Center will establish the Medical Centerâ&#x20AC;&#x2122;s brand for the expanded cancer program through the design of both the patient experience and the building. Together the Cancer Center and the Health & Wellness Center form the new outpatient anchor of the campus. Mount Sinai Health System Health & Healing New York, New York The Mount Sinai Center for Health & Healingâ&#x20AC;&#x2122;s primary focus is on wellness and offers an integrated, preventive approach to medicine. Their clinic was recognized as one of the first healthcare spaces in the US to incorporate sustainable materials as well as Feng Shui principles. Demand for The Centerâ&#x20AC;&#x2122;s services drove the need to expand their practice. Array designed an expansion plan which doubled their practice space onto another floor of the same building, allowing the original practice to operate during design and construction. Array recently completed the renovation of The Center for Health and Healing incorporating design tenets based in the Feng Shui design methodology in conjunction with evidence-based design concepts. The new 10,000 SF floor includes a gym with physical therapy services and treatment rooms; reception and waiting areas; clinical space with consultation and exam rooms; massage room; and, support areas. Feng Shui findings were based on an energy profile which consisted of an analysis of compass orientation, astrological influences, building footprint and floor plan analysis. Using these findings, space layout was adjusted to promote harmony with nature, culture and community. Using Feng Shui principles, space layout was refined to promote harmony and balance. Mount Sinai Health System Health & Healing Feng Shui tenets: •	Enhanced healing potential throughout the floor was capitalized by adding mineral quality crystals in wall cavities and ceilings requiring positive energies. •	Enhanced brand recognition and client loyalty by designing bold dramatic graphics at entry of elevator lobby. •	Natural daylight brought into formerly dark areas. •	Enhanced income generation and business growth by incorporating red, orange and green accents and special textured materials. The project accomplished Continuum’s Health Partners’ Center for Health & Healing’s goal to transform the quality of healthcare and its delivery toward a more holistic model conscious of the role played by the environment in the healing process. Demand for the Center’s services grows and is expected to increase as healthcare in the United States continues to shift from one focused on illness and reaction to one of wellness and prevention. Emblem Health Brooklyn, New York A new 160,000 SF seven-story Medical Office Building with elevated parking, is designed to provide outpatient medical services at a bustling Brooklyn intersection. Serving the community in this urban setting, the building was strategically located near major mass transportation to attract patients to the health systemâ&#x20AC;&#x2122;s expanding services. The project is one of the largest and newest buildings in the neighborhood and will act as a catalyst for community growth. Urgent Care and Imaging, which have high walk-in patient volumes, were placed at the ground floor, setback and surrounded in highly visible storefront, under a continuous marquee, to help connect to the urban fabric. Vehicular traffic is directed discretely off the street, up a ramp into three levels of parking, cloaked in a back-lit veil of custom perforated soft white metal panel. Physician practices are located on the top three floors of the building with a draped in articulated glass wall. The folding glass wall was parametrically designed to respond to mitigate late afternoon solar gain, as well as provide stunning views of the city from the waiting areas. Healing Environments CREATE A SANCTUARY To create a sanctuary offering users quiet, outdoor space away from in- and outpatient treatment areas is always a challenge. Array understands that designing a therapeutic garden is a cooperative effort, one that involves the entire design team and key project stakeholders, frequently a donor or Family Advisory Group. The goal to all our healing gardens is to provide a place for respite and relaxation, where you can spend time alone to think, rest and regain emotional and physical energy. Optimismâ&#x20AC;ŚAt the core of every design effort is our belief that the physical environment has the power to nourish and uplift spirits A shared recognition of, and respect for, the very personal effort and endurance required to withstand the physical and psychological stresses of battling a disease is what drives and inspires us. We are committed to finding ways to evoke a sense of hope, strength and resilience. Inviting natural light deep into the building promotes a sense of calm and well-being. References to nature serve as an affirmation of life. Serenityâ&#x20AC;ŚPatients and families deeply appreciate environments which promote a sense of calm as a counterpoint to the chaos inherent in a disease diagnosis. Simple, intuitive wayfinding is empowering. Colors and textures which reference the beauty in our natural surroundings are grounding. It has been proven that walking a labyrinth at any age can lower a personâ&#x20AC;&#x2122;s heart rate and blood pressure. Evidence-based design studies clearly illustrate the benefits of incorporating healing and wellness gardens into hospital design. For thousands of years, people have walked labyrinths to find calm and peace, and it has been proven that walking a labyrinth at any age can lower a personâ&#x20AC;&#x2122;s heart rate and blood pressure. Respiteâ&#x20AC;ŚProviding opportunities for patients to have a quiet moment of reflection in a beautiful and dignified setting is powerful. During visioning sessions, patients frequently share the positive impact of having a place to garner strength, re-center and re-invigorate for the battle ahead. It is in those quiet, meditative moments that they are frequently able to re-connect and rally their inner resources. Healing gardens have universal appeal. Families and caregivers are also drawn to these sacred places as a source of strength and recommitment in times of doubt or fatigue. Sensoryâ&#x20AC;ŚFor patients who are out of balance and whose life energies are weakened by illness, the environment can provide a sense of order. Ambient conditions, such as temperature, air quality, smells, sounds, physical comfort and light are the backdrop for every patient experience. The layout of the physical space and the entire design of the clinical environment must be congruent with what the patient expects to find in that environment. Every patient will respond to the physical environment in one or some combination of three ways: physiologically, emotionally and cognitively. Recognizing the impact of a patientâ&#x20AC;&#x2122;s vulnerability can and should inform the simplicity or complexity in any given patient environment. Nemours / Alfred I. duPont Hospital for Children Multi-Specialty Outpatient Center Deptford, New Jersey When this national childrenâ&#x20AC;&#x2122;s hospital decided to move into a new market, they needed move quickly. As with all ambulatory projects in todayâ&#x20AC;&#x2122;s competitive environment, being first to market with the right product at the right cost is critical. Patient and Family focused design in the context of maximum efficiency is the hallmark of the final Ambulatory project and was achieved through a rigorous process to define target outcomes and then test solutions. Current and Future State process mapping, Data Collection, Visual Programming, Experience Mapping and Continuous Stakeholder Engagement are cornerstone tools used to ensure the right space was built at the right size at the right time. With the rapid evolution of care and reimbursement models and the uncertainty of the future, a flexible and adaptable platform was created to be viable today and tomorrow. Shifting the paradigm to create a new, integrated multi-specialty outpatient center. Arrayâ&#x20AC;&#x2122;s Process-led design approach rapidly defined and designed a new, fully integrated multi-specialty outpatient center that features flexible provider clinics, physical therapy, diagnostic imaging, wellness, and ambulatory surgery. Our approach, using Lean as a foundation, allowed Nemours to work through complex questions about integration, resource deployment, and business/revenue implications while studying physical configurations and cost structures to support them. All of this was achieved without sacrificing commitment to capital budget objectives as well as schedule. Patient and Family focused design in the context of maximum efficiency is the hallmark of the final project and was achieved through a rigorous process to define target outcomes and then test solutions. Current and Future State process mapping, Data Collection, Visual Programming, Experience Mapping, and Continuous Stakeholder Engagement are cornerstone tools used to ensure Nemours built the right space at the right size at the right time. Staffing efficiencies, provider load, throughput, and technology were integrated into the architecture process. With the rapid evolution of care and reimbursement models and the uncertainty of the future, a flexible and adaptable platform was created to be viable today and tomorrow. Montefiore Medical Center selected Array to consolidate ambulatory services from three campuses and outpatient clinics into a new, state-of-the-art Ambulatory Tower that would become the benchmark for their expanding Ambulatory Care services. Array provided planning and design services for a new 12-story Ambulatory Surgical Center on a site that received prior zoning approval for a hotel. To avoid obtaining a variance, which would result in significant cost and delays, we could not alter the footprint and setbacks. 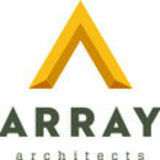 Array developed a unique design solution incorporating dedicated elevators for staff and materials within the operating suites and support areas. Although the 12 ORs and four procedure rooms (sized to become additional ORs if needed) are split between three floors, simulation modeling showed that the dedicated elevators facilitated patient flow and reduced room turnaround time. I actually go into every project with the primary goal of building less, and if we can avoid it, building anything at all. It is my responsibility to help our clients think critically about each move. 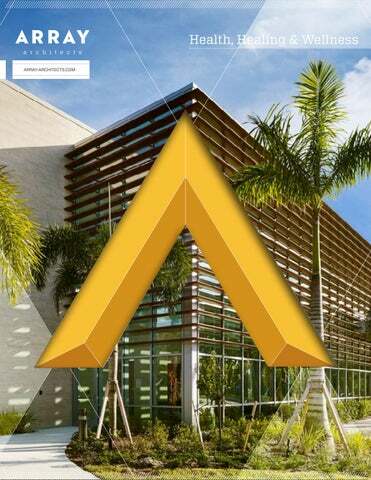 PROGRAM GROWTH As Nicklaus Children’s Hospital has evolve, what was once the prominent front door of the George E. Batchelor Research and Academic Pavilion has become obscured behind newer facilities and garages. The concurrent growth of the Hospital’s outpatient cancer and blood disorders programs has provided the synchronistic opportunity to repurpose, reorient and expand the facility into a place of distinction along the campus’ main pedestrian plaza. With an architectural expression that will serve as a bridge between the colorful historic campus and the thoroughly modern facilities under construction, the new Center will be home to outpatient clinics and tomotherapy, clinical laboratories and infusion therapy. These programs will be woven together with new, patient-friendly vertical circulation elements and will be capped with a sheltered roof garden serving as respite for infusion patients and their families. In order to effectively and rapidly achieve the systemâ&#x20AC;&#x2122;s expansion goals, a collaborative, multidisciplinary, integrated team was assembled. After thoroughly analyzing transformational options ranging from sequential renovations of existing facilities, to major additions, to new facilities â&#x20AC;&#x201C; the team quickly defined a roadmap for project success and began tackling the most impactful opportunities for improvement. Among the critical factors identified for rapid study were the need to right-size the building program in order to avoid constructing superfluous square footage as well as expediting the design and construction schedules. An optimized program was achieved by collocating departments such as the ED, Observation Beds and Pre- and Post-Operative Care Units which can flex as demand fluctuates. A common planning grid was employed to ensure flexibility between stacked patient units and other program types while also achieving a compact and patient-centered layout. Concurrent with these program studies, the team analyzed local market conditions to determine the optimal logistical, system and material options that would result in a cost-effective, sustainable and rapidly constructible solution. BROWSE Our Thoughts Click on our Thought Leader above to learn how Array designs to inspire hope in our healing environments. By embarking on a highly-collaborative structure from the outset, the integrated team was able to identify methodologies that have resulted in a significant reduction in square footage from the original benchmarked program as well as defining a schedule that will result in an operational facility within 33 months from the start of design. Environments have the power to set our expectations, lift our spirits and inspire hope. This is what motivates me to create spaces that mitigate the challenges faced by all who enter a healthcare facility. One of just 12 freestanding cancer hospitals in the nation designated as a Comprehensive Cancer Center by the National Cancer Institute, the new, 120-bed, 10-story, 370,000 SF University Hospitalsâ&#x20AC;&#x2122; Seidman Cancer Center in Cleveland, Ohio, is designed to support all aspects of the healing process. As part of a system-wide Facilities Master Plan, University Hospitals engaged Array to provide programming and planning services for a new Cancer Hospital to centralize the various cancer care components that were dispersed throughout their 4-city block campus in downtown Cleveland. Designed with clear exterior and interior circulation paths, the building improves spatial orientation for oncology patients under high levels of stress. Care areas are organized to treat specific patient populations. Well-conceived floor plans and attention to detail in the clinical zones afford efficient, optimal work environments for caregivers. The facility incorporates space for clinical trials, diagnostics, outpatient and inpatient treatment, surgery, patient education programs, radiation oncology, infusion therapy and teaching space. â&#x20AC;&#x153;Recently my wife was a patient at Seidman Cancer Center. Our experience there, although unpleasant by nature, was certainly enhanced by the environment your firm has created. The attention to detail in everything from the patient rooms to the waiting spaces most definitely has a positive role in the healing process. The abundance of natural light and selected finishes were most impressive. Thank you for your contribution helping all who enter feel a little better.â&#x20AC;?